STONE SOUP was selected for the Primary Education Project in Nigeria. The Laura Parsons Pratt Award from the Federation of Protestant Welfare Agencies. This award was given to me for my life’s work of writing books and supporting libraries. I was delighted to receive this prestigious honor from an organization that helps children in many ways. Earthworm Award for the book that “does the most to encourage environmental awareness and sensitivity in children.” Awarded for LITTLE WHALE. President Clinton awarded me the Arkansas Traveler Award when he was Governor. Me (on the right) with Bill Clinton when he was Governor of Arkansas. Be careful. Birds are so tame in the Galapagos that they might take your hair to make a nest. More than 20 of my books have been nominated for state awards, voted by the children of those states. SCRAM, KID won the Horn Book Award and was included on “The Best of the Fall Season” list. NICHOLAS BENTLEY STONINGPOT III was listed in The Best and the Brightest of the Year by the Chicago Sun-Times. A “Reading Rainbow” television selection. LITTLE WOLF was selected by the American Humane Association. HALF A KINGDOM was named a “notable children’s book in the field of social studies,” chosen for the Reading Rainbow television program, and was a Junior Literary Guild selection. SHARK LADY was given the Sequoyah Children’s Book Award. 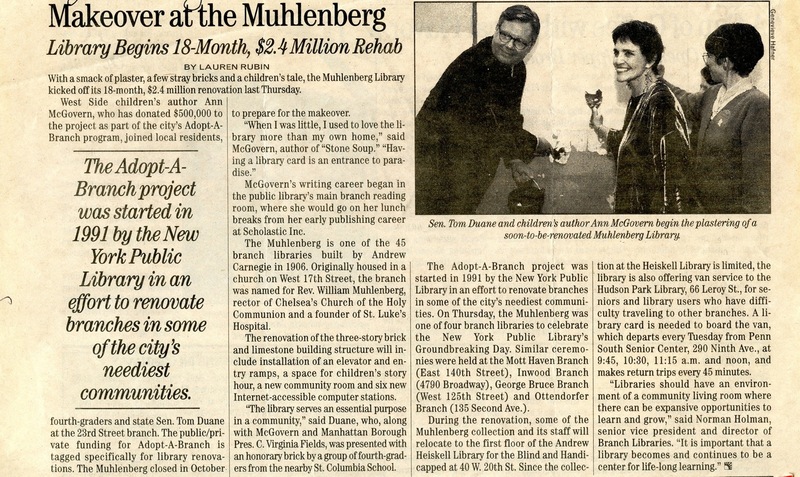 The Muhlenberg Public Library in New York City named their Children’s Room “The Ann McGovern Reading Room” What an honor that is! I was asked to start the renovations at the library!